Today on the dog walk I saw it again... Or rather I heard it and then I saw it. It's a roar, like river rapids, which is a little disorienting when you're standing on a street corner in the city. Not to worry it's on purpose! 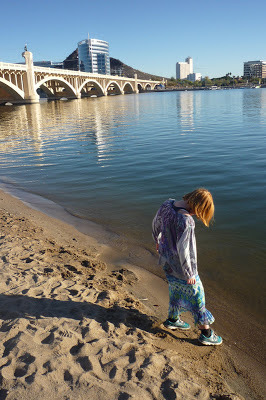 The Salt River is why people have settled in this region for something like 1,000 years. Phoenix is not just some random spot in the desert where they decided to build a city... That would be Las Vegas. Anyway, I started another snail but he's in a lot of uninteresting pieces right now, so I'll post some pictures later when he gets more interesting. Recently Phoebe yelled to me, "Hey Mom! What's red and smells like blue paint?" Yesterday I painted a "Hello Kitty House". It's monochrome, but then I added red paint.